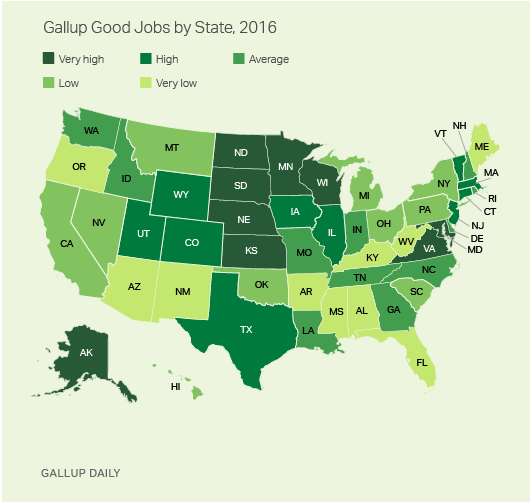 WASHINGTON, D.C. -- Five U.S. states -- South Dakota, Maryland, Nebraska, North Dakota and Minnesota -- had Gallup Good Jobs (GGJ) rates above 50% in 2016. West Virginia, at 36.6%, had the lowest rate for the third consecutive year. Gallup's GGJ metric tracks the percentage of the U.S. adult population aged 18 and older who are employed full time for an employer for at least 30 hours per week. These results are based on Gallup Daily tracking interviews throughout 2016 with nearly 355,000 U.S. adults. Gallup does not count adults who are self-employed, work fewer than 30 hours per week, are unemployed or are out of the workforce as payroll-employed in the GGJ metric. The differences in GGJ rates across states may reflect several factors, including the overall employment situation and the population's demographic composition. States with large older and retired populations, for example, would have a lower percentage of adults working full time. Several of the states with the lowest GGJ rates in 2016 -- West Virginia, Florida and Maine -- have the largest proportions of residents aged 65 or older. 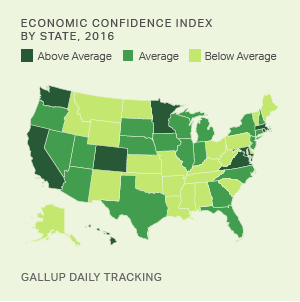 Regardless of the underlying reason, however, the GGJ rate provides an indication of a state's economic vitality. A cluster of states in the northern Plains and Rocky Mountains regions made the top 10 on this measure. The two states bordering the nation's capital, Maryland and Virginia, also had higher rates of full-time employment for an employer. Gallup's U.S. underemployment rate is the percentage of adults in the workforce who are not employed but are looking and available for employment or who are working part time but desire full-time work. While GGJ reflects the proportion of adults working full time for an employer relative to the entire population, Gallup reports the underemployment rate as a proportion of adults in the workforce -- all those working or seeking work. Minnesota had the lowest underemployment rate, at 8.9%, with South Dakota close behind, at 9.2%. New Mexico had the highest underemployment rate, at 17.5%, up from 15.5% measured in 2015. New York, California and Mississippi all had underemployment rates of 16% or more in 2016. 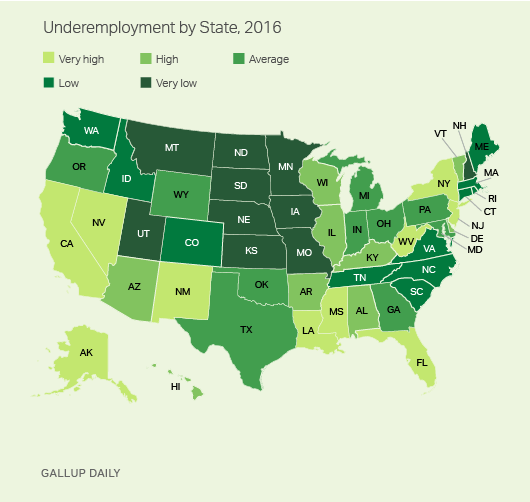 Consistent with the geographical pattern for Gallup Good Jobs rates, states in the northern Plains and Rocky Mountains regions -- including Minnesota, North Dakota, South Dakota, Nebraska, Iowa, Kansas, Montana and Utah -- were among those with the lowest underemployment rates in 2016. Underemployment was highest in the Southwest and Southeast, as well as in a few Mid-Atlantic states and Alaska. 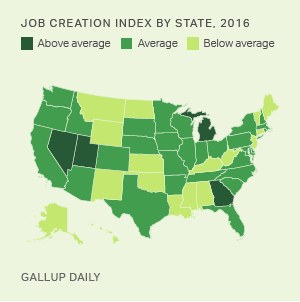 The most robust labor markets in the U.S. continue to center around the northern Plains states and the nation's capital, with consistently high rates of full-time employment for an employer and relatively low underemployment. The Southwest, Southeast and Appalachian regions continue to have some of the lowest GGJ rates. Meanwhile, underemployment remains a more serious problem for large states on the coasts -- such as California, New York and Florida -- than for those in the interior of the country. These areas include some of the most populous and densely populated states with more competition for jobs. Results for this Gallup poll are based on telephone interviews conducted Jan. 2-Dec. 30, 2016, on the Gallup U.S. Daily survey, with a random sample of 354,980 adults, aged 18 and older, living in all 50 U.S. states and the District of Columbia. For results based on the total sample of national adults, the margin of sampling error is ±1 percentage point at the 95% confidence level. All reported margins of sampling error include computed design effects for weighting. Margins of error for individual states are no greater than ±6 percentage points and are ±3 percentage points in most states. The margin of error for the District of Columbia is ±6 percentage points. All reported margins of sampling error include computed design effects for weighting.